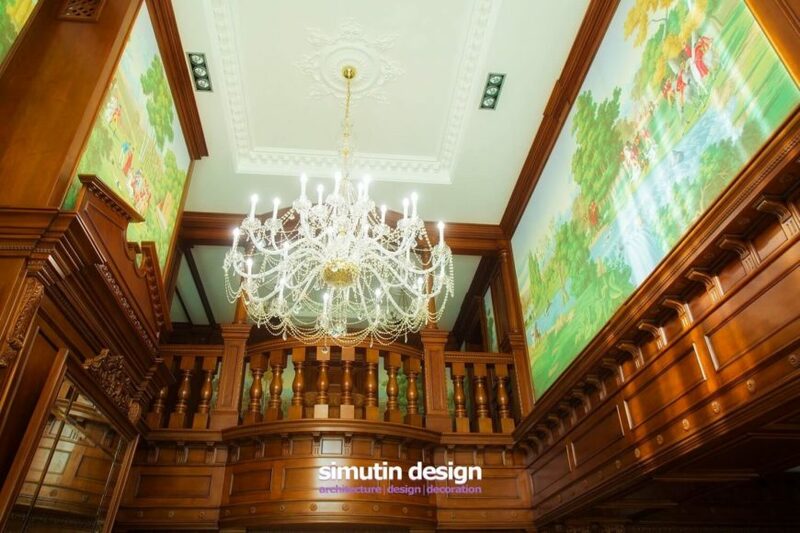 Welcome to this incredible gallery featuring one of the most opulent homes to ever appear on our site: the fabulous Key house by Simutin Design. 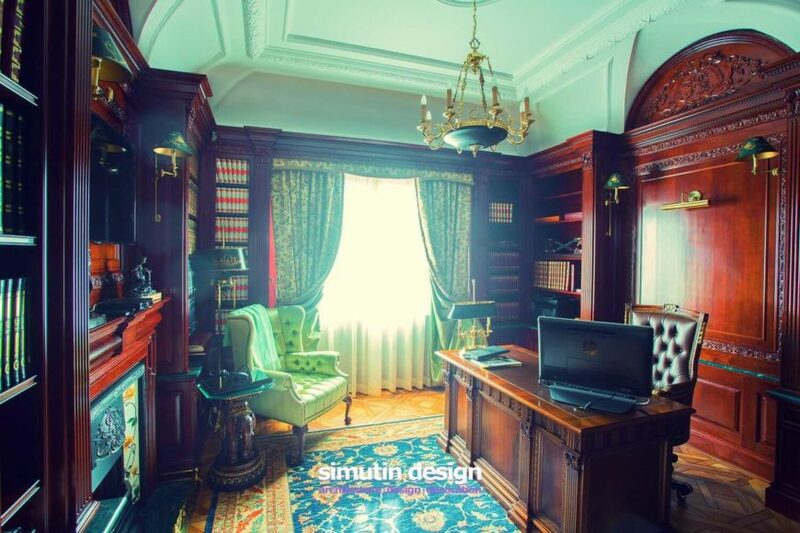 Russian designer Sergey Simutin created this beautiful home to suit the incredible sophistication and taste of the client. He believes in creating unique designs that do not cater to current fashion or trends, instead borrowing from different styles to create one-of-a-kind designs that cannot be imitated. Peruse this gallery carefully, and keep a sharp eye out for each detail in every single room. There isn’t a single element that is undecorated throughout the entire home. Of particular interest is the extensive use of wood throughout the home. 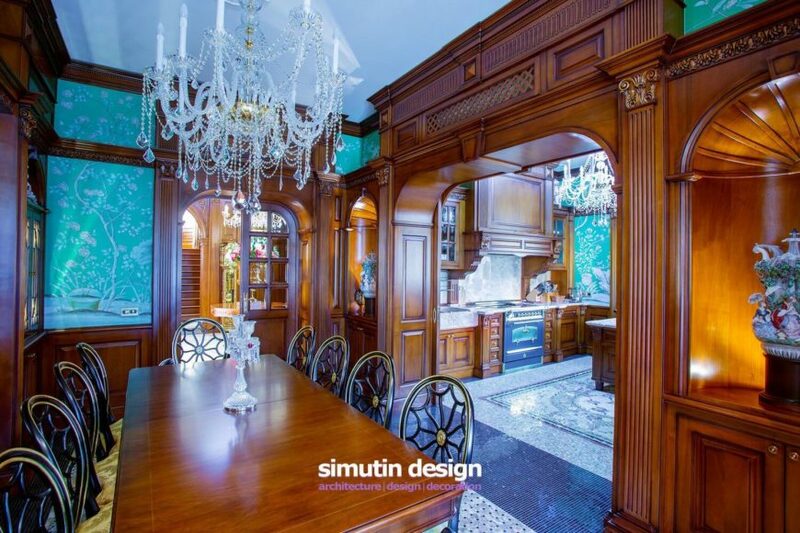 This is a hallmark of older homes and mansions, where the architecture of each home was intricate and utterly detailed, a feature that is usually missing from contemporary homes. The walls of this home are in wood and painted in beautiful pastoral murals that give sections an old-world English Country atmosphere. 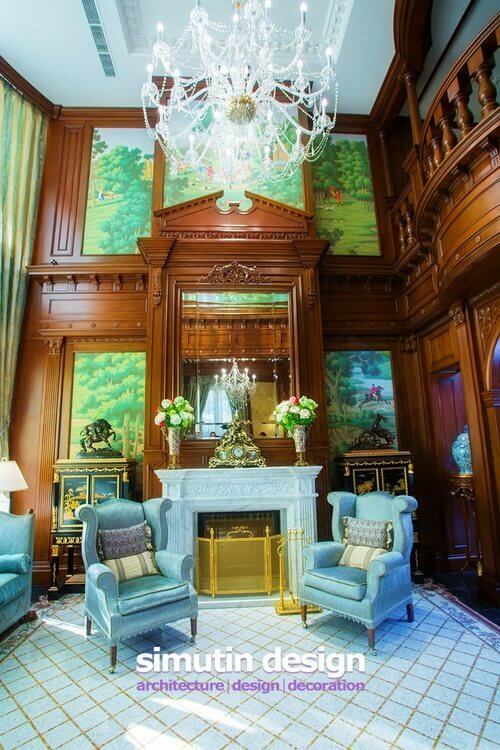 Works of art, sculptures, and antique furniture fill the home, each in pristine condition. 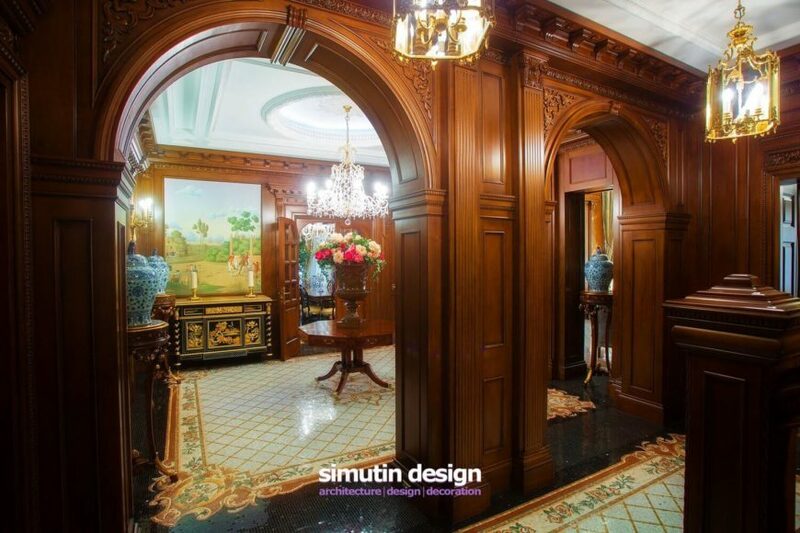 Rich carpets and rugs add life and color to the opulent dark wood throughout. Thick, luxurious fabrics and textures in the more private areas of the home enshroud the owners in utter luxury. It’s hard to believe anyone would willingly leave this gorgeous gem. We hope you enjoy the home as much as we did! 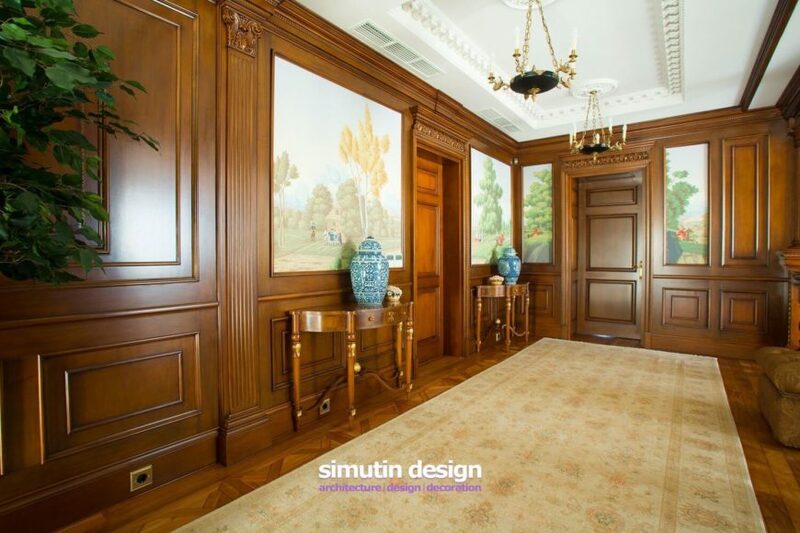 Entry to the home is provided through two incredible rich golden wood doors. The entry is rather narrow, with a single gilded door leading out. The walls are lined with gilded urns filled with fresh flowers. Subtle murals of trees and birds grace the walls. 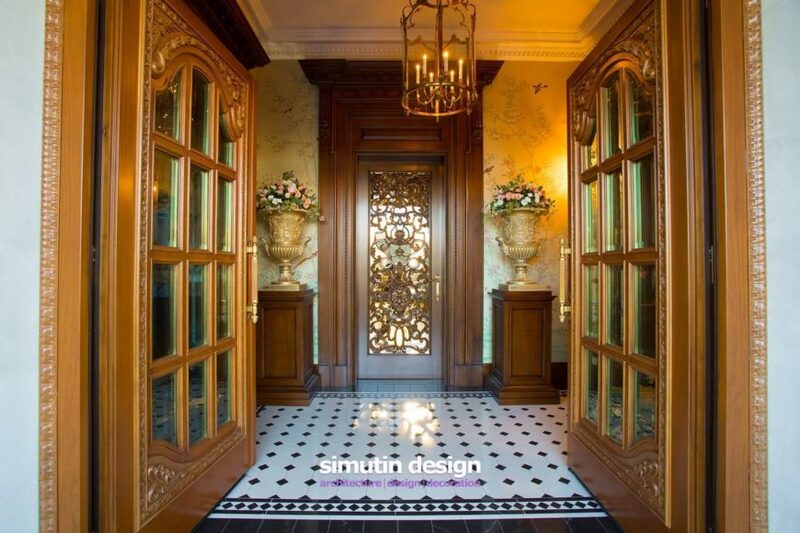 The gilded single door leads into the crossroads of the home. 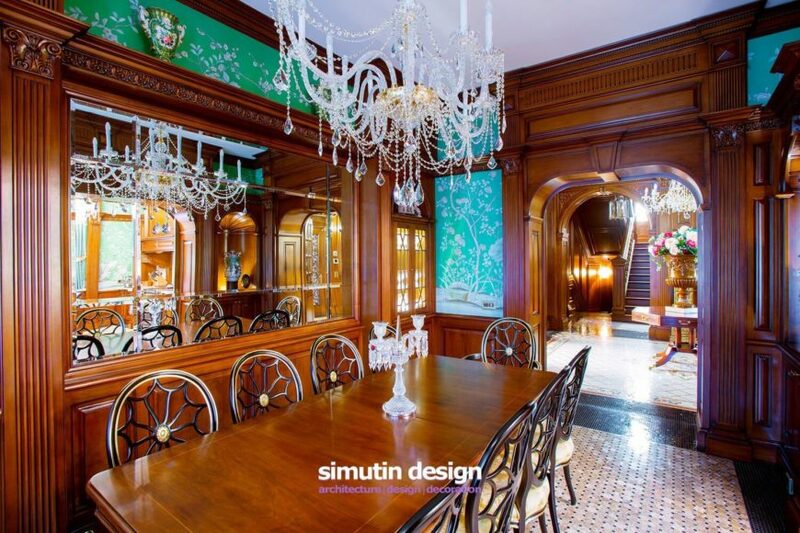 A crystal chandelier hangs above a beautiful wooden octagonal table in the center of an ornate mosaic tile floor. Doors lead into other rooms on the home’s main floor. Through the open archway, we cross into another room. 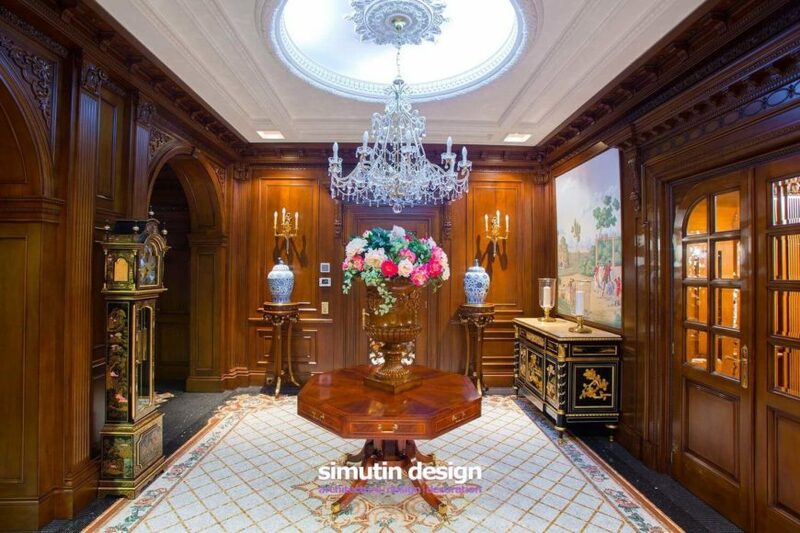 Looking back into the hallway, we an see two beautiful blue urns on ornate pedestals one either side of a solid wood door. Pulling back, we see that the arch is actually part of a pair that leads into another mosaic tile floor room with a grand staircase to the second floor. 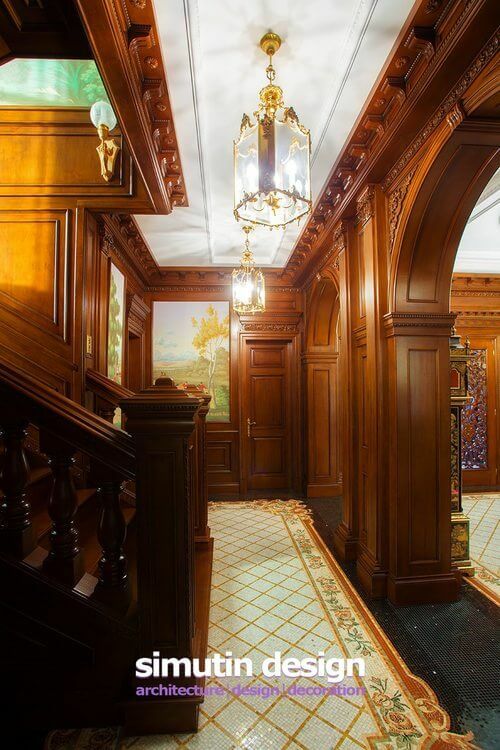 A final look at the beautiful hallway. 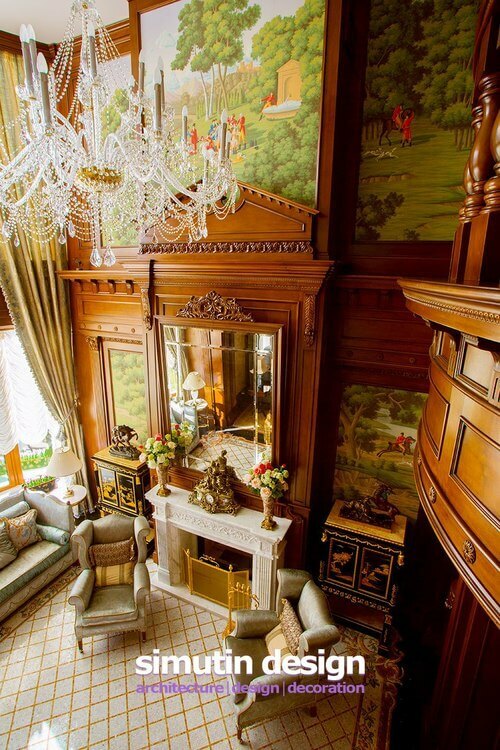 Note the gorgeous East Asian Grandfather clock, hand painted. Also of note is the coffered ceiling with a lighted dome at the center. Moving through a large archway, we enter the two-story great room. The mosaic tile continues into this room, picking up the soft blues of the silk couch and armchairs. The style of the large clock in the previous room is matched by two cupboards in the same style on either side of the wood-burning fireplace. 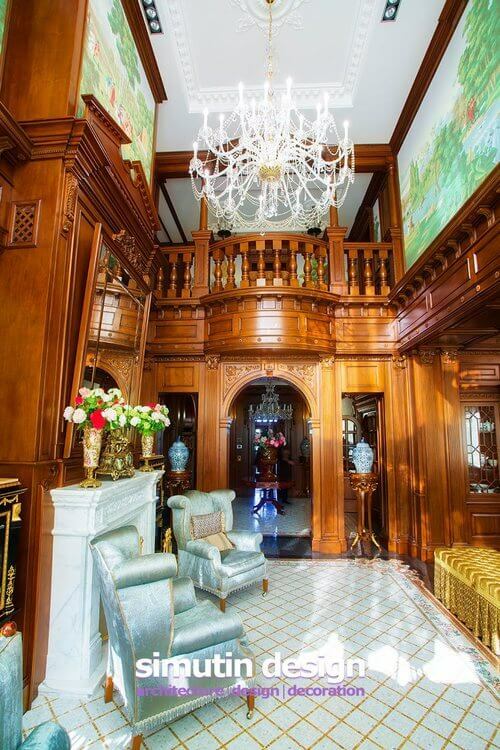 A large balcony overlooks the great room, along with a massive chandelier. 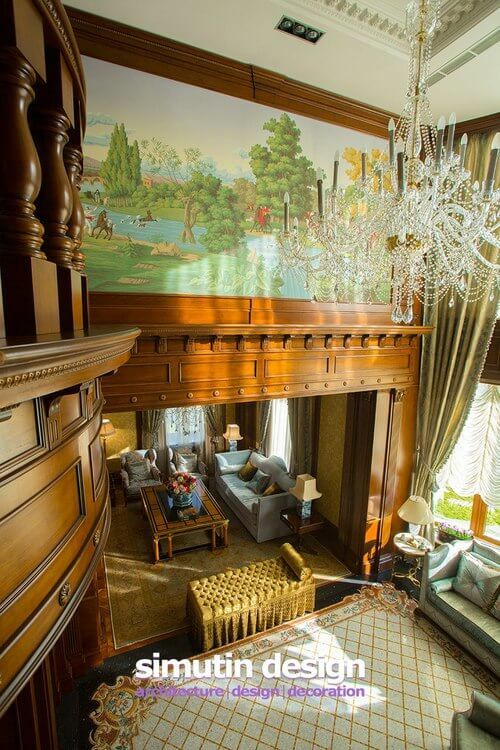 The top of the great room is filled with pastoral murals in soft greens. 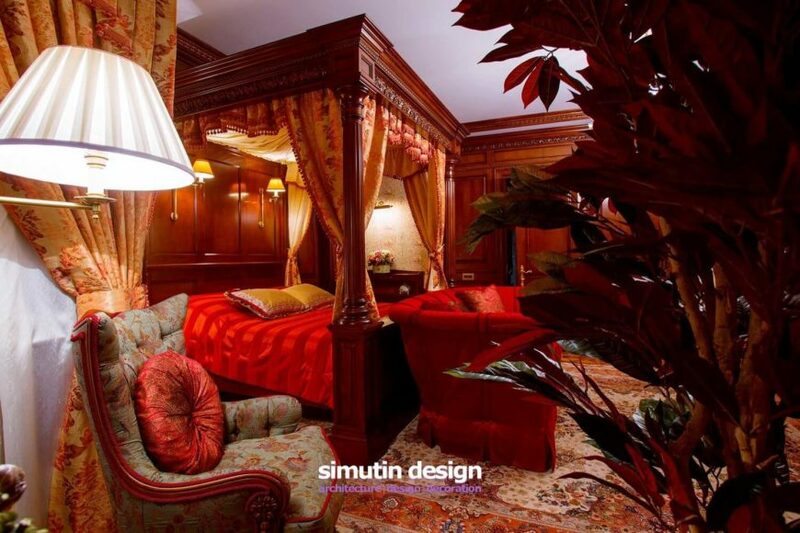 To the right of the room is a golden upholstered chaise. 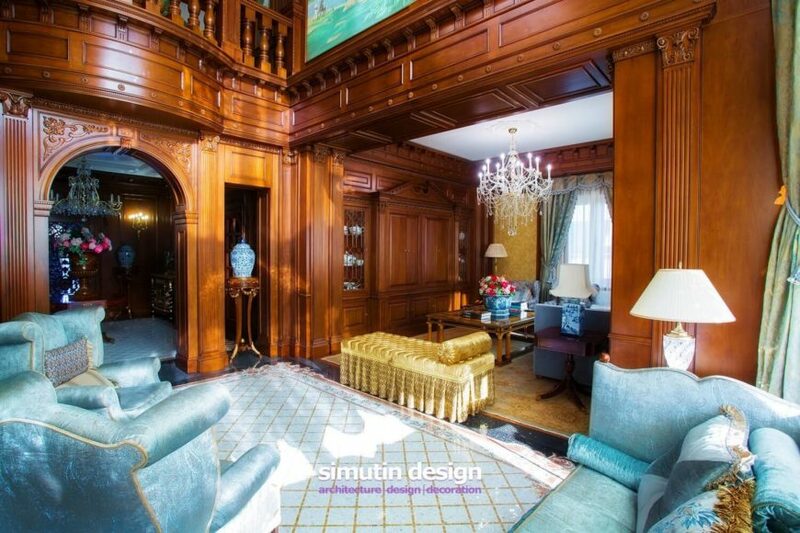 A closer look at the top of the room reveals the absolutely stunning woodwork and murals. 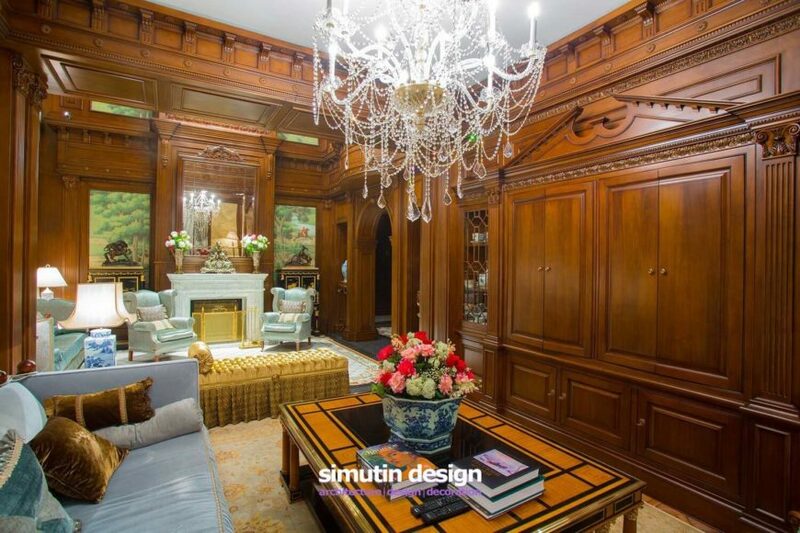 The chandelier hooks into a large medallion in the center of the tray ceiling. 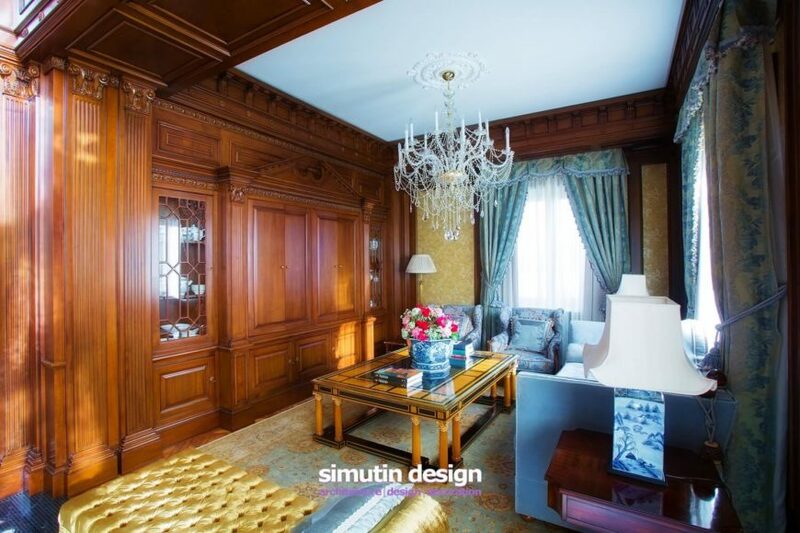 Every accent chosen for this room speaks to the sophistication and opulence of the client’s style. Note the Baroque style clock on the mantle, with two urns of flowers on either side. Statuettes grace the top of the cabinets. From this angle we can see the way the great room transitions into a more casual living room area. A matching chandelier, although on a bit smaller scale, lights the space. Moving close, we can see the heavy fringed drapes on the large windows, several lovely porcelain lamps, and stunning built-ins along the left wall. Rich, soft fabrics in the sofas complement the rich wood of the built-in entertainment center and curio cabinets. Pocket doors slide open to reveal an enormous flat-screen television and sound system, transforming this formal living room into a family room. 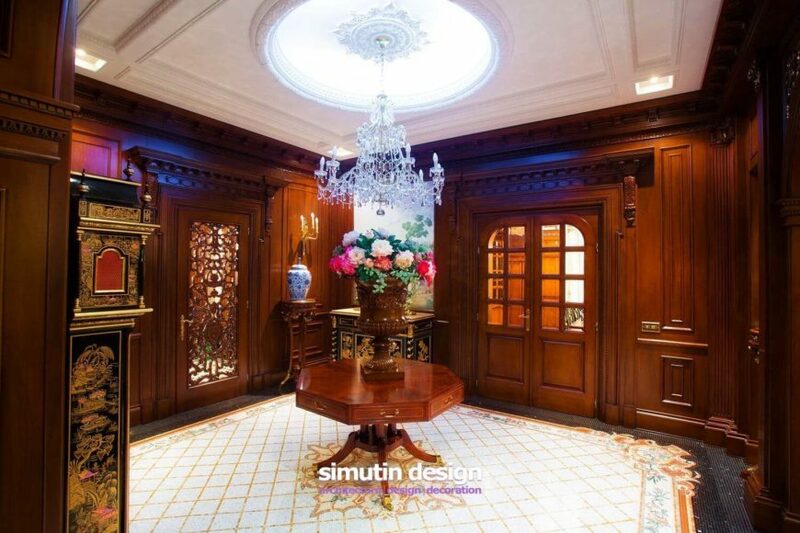 Moving back through the hallway, we enter the formal dining room. This rather narrow space, compared to the larger great room and living room, is made to feel larger by placing an enormous mirror on one wall. 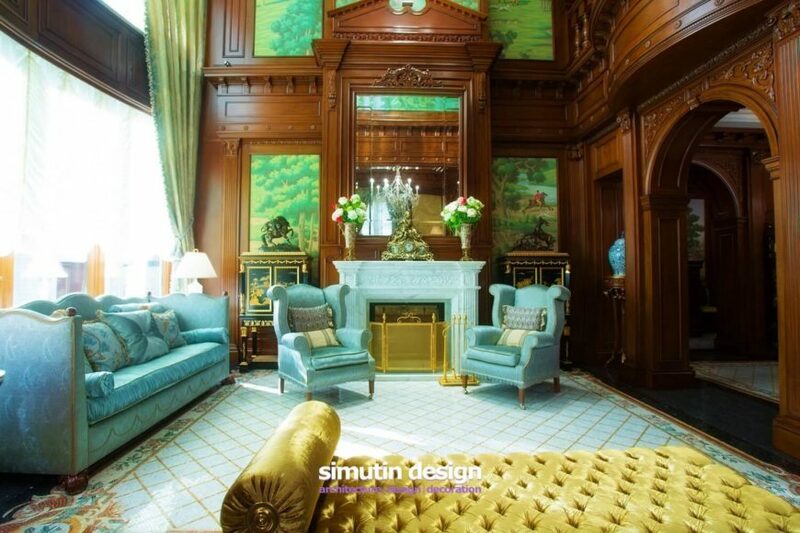 Bold turquoise blue panels with white floral designs fill in a few spaces, accenting the rich wood. 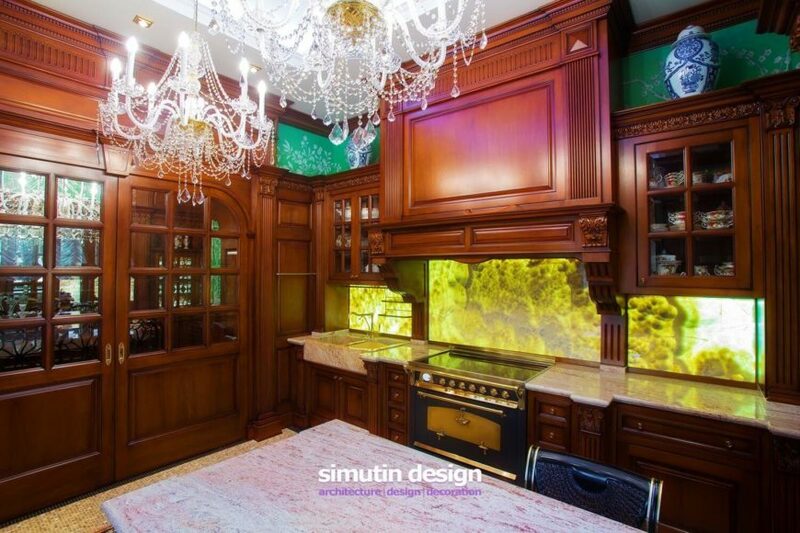 From this angle, we can see into the adjacent kitchen, and into small lighted alcoves that display the owner’s beautiful works of art. 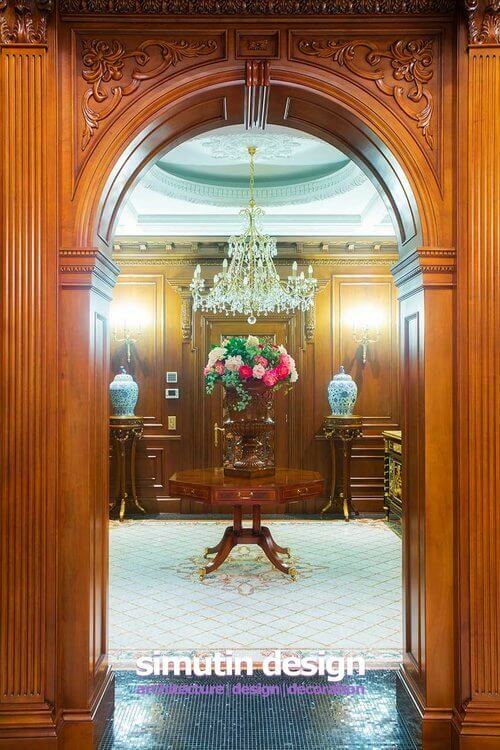 Note that each archway contains hidden pocket doors that can be used to close off the connected rooms during a dinner party or other social event. Inside the kitchen, we can see the closed pocket doors to the dining room. The blue and white panels continue into the kitchen, where a light granite contrasts with the rich reds of the wood. Multiple chandeliers hang above the island, lighting the enormous space. Also of note is the stunning backsplash in bold clouds of yellow. We return to the where the main hall transitions into the grand central staircase, noting the white marble ceiling above the narrow hall. 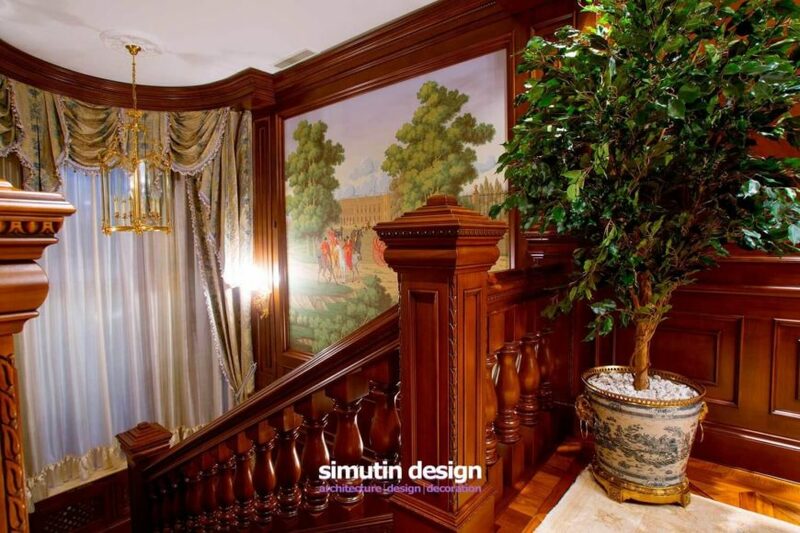 Around the first turn in this staircase, we are met with a lighted alcove featuring a beautiful vase. 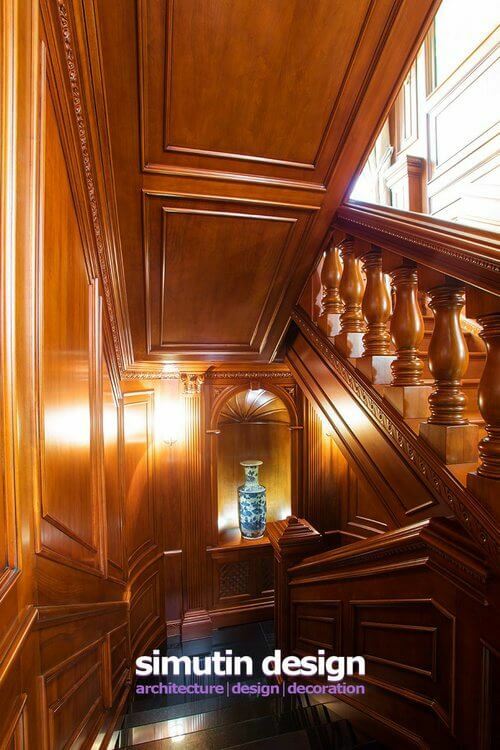 The staircase’s beautiful, carefully crafted details are sleek and polished. At the top of the staircase, the mosaic tile of the previous floor transitions into a rich parquet floor covered by a luxurious rug. An ornamental potted tree rests in the corner, complementing the large trees in the mural beyond. 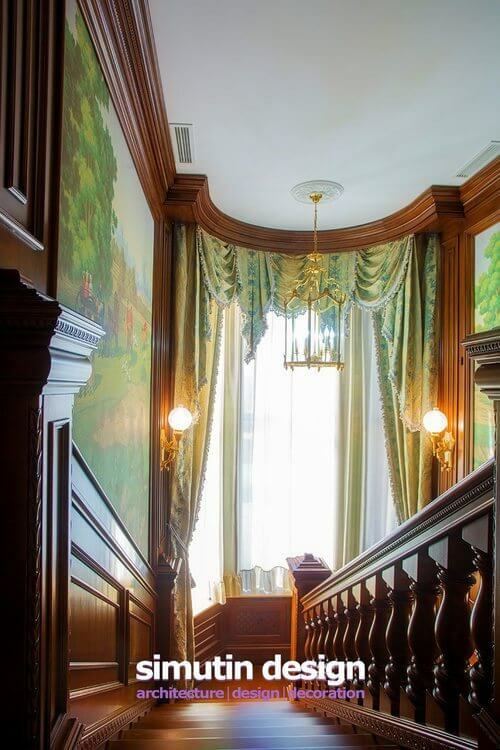 As we look down the stairs from the top, we are presented with an enormous bay window with antique globe lights on either side. A simple light fixture hangs from the tall ceilings. The windows are framed on either side by giant pastoral murals. An aerial look from the second floor balcony down on the great room. From this height, we can see the murals that stretch up to the ceiling, along with the more delicate features of the chandelier. Swiveling to the left, we look down on the transition between the living room and great room. Even the space above the archway to the living room is covered by an enormous, unique mural. Spotlights installed above ensure that the art is well lit, even at night. 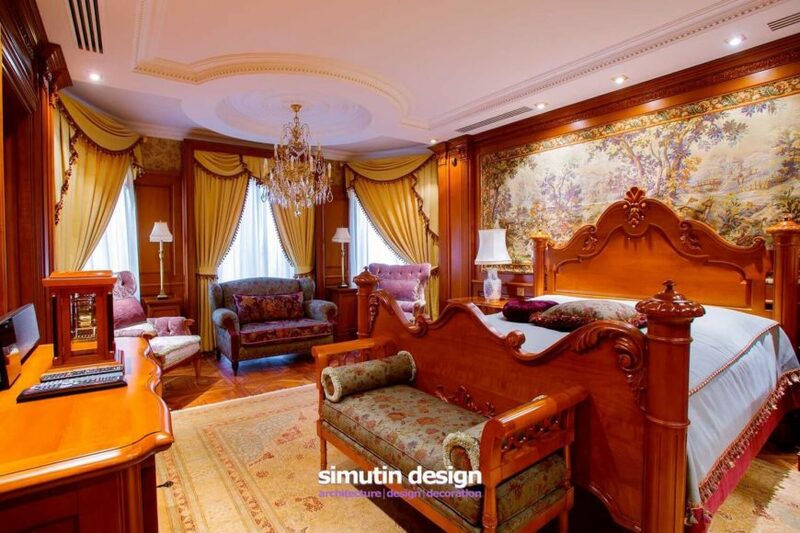 Continuing into the guest suite, we see ornate furniture and architectural details in abundance. The wall behind the headboard is covered in a beautiful mural in more earthy colors than in the rest of the home. A chandelier hangs from a domed ceiling above the large seating area to the left. The second floor also plays host to a large gallery room at the top of the stairs, with small doors leading into each of the bedrooms. A soft rug covers the parquet floors. 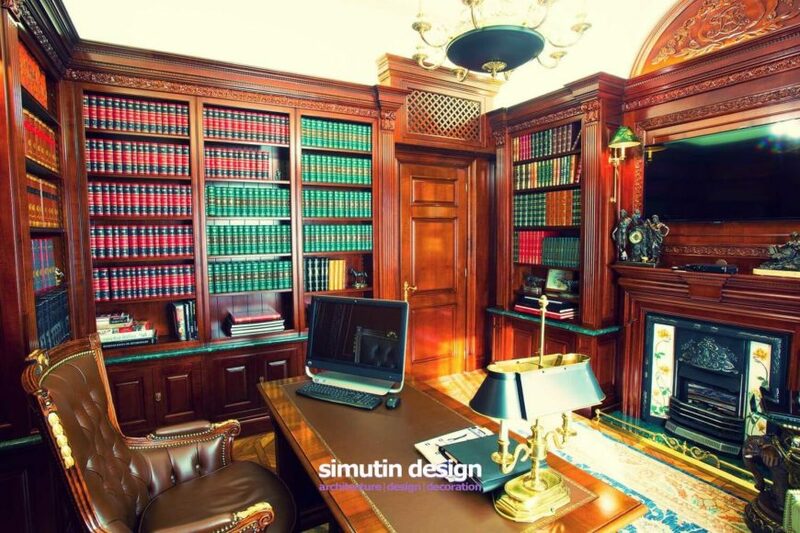 As we move into the library and office, we are struck by the sheer size of the built-in bookcases and the ornate executive desk. A leather chair sits commandingly behind the desk. A more masculine chandelier lights the room. From behind the desk we can see the beautiful fireplace and the large television framed above it. To the left of the desk we see even more fully stocked bookcases. The master bedroom is utterly different from any other room. In rich reds and an autumn leaf motif, the rich textures and colors of the fabric add to the warm reds of the wood. 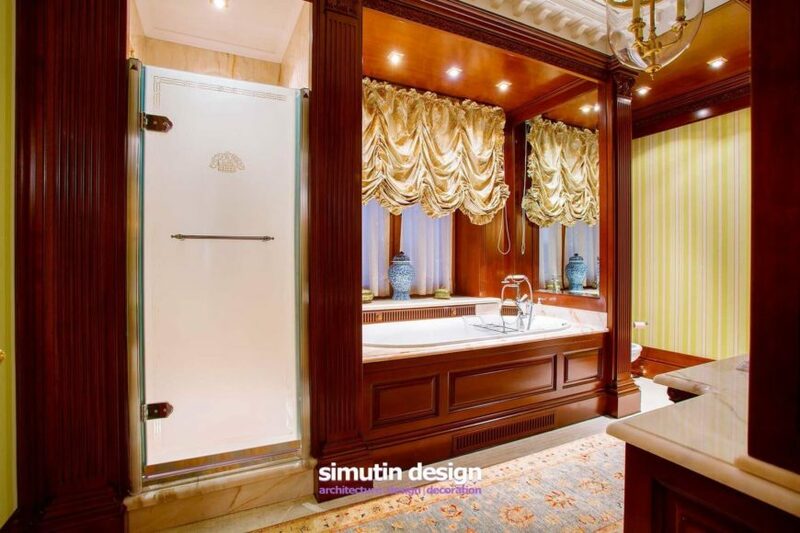 The master bathroom features a steam shower encased in marble, marble countertops and a soaking tub enclosure, and silken, ruched curtains.